Wambo Shire on the western Darling Downs entirely surrounded the town of Dalby. Its shire offices were in Dalby, but its towns included Bell, Jandowae and Warra. As the Shire's principal town, Jandowae is the site of the Shire's recently built community and cultural centre. In 2008 Wambo Shire was amalgamated with Chinchilla Shire, Dalby Town and Murilla, Tara and the southern third of Taroom Shires to form Dalby Regional Council. The Condamine River passes through the south-west sector of the former Shire, flowing across black soil plains, and the north-east of the Shire lay in the Bunya Mountains. The Shire's area was 5700 sq km. By 1850 much of the future Wambo Shire was under pastoral leaseholds, and the Jimbour run of 810 sq km was by far the largest. Acquired in 1844 by Thomas Bell, the Jimbour run was managed by his son, Joshua Bell after 1851. Bell junior built one of the few grand squatter homesteads in Queensland, using local stone and Bunya cedar. Jimbour House is on the Australian heritage register and its gardens are open to the public. In 1863 Dalby was proclaimed a municipality and the Western railway line through Dalby was opened in 1868. The line was extended to Warra in 1877. In 1866 parts of the pastoral stations were resumed for farm selections and by 1880 the district was sufficiently settled to be made a local government division. The Wambo division of 13,210 sq km extended from the Dividing Range to Tara. It is thought that the name was derived from an Aboriginal word describing a long waterhole, possibly a reference to Wambo Creek, a tributary of the Condamine beyond Chinchilla. During the early 1900s there was considerable closer-settlement in the north-east of the Shire and a railway line from Dalby to Bell was opened in 1906. Similar settlement in the direction of Tara led to a line from Dalby through the south-west of the Shire in 1906. A northerly line to Jandowae was opened in 1914. The intensification of settlement resulted in the formation of new shires, and in 1912 the south-west and north-west parts of Wambo Shire were detached and added to Tara and Chinchilla shires. The loss to Tara Shire absorbed some land that was badly affected by prickly pear, but patches in that direction and east of Dalby remained until the late 1920s. The Shire had a mixture of farm products - dairying, wheat, beef and wool. 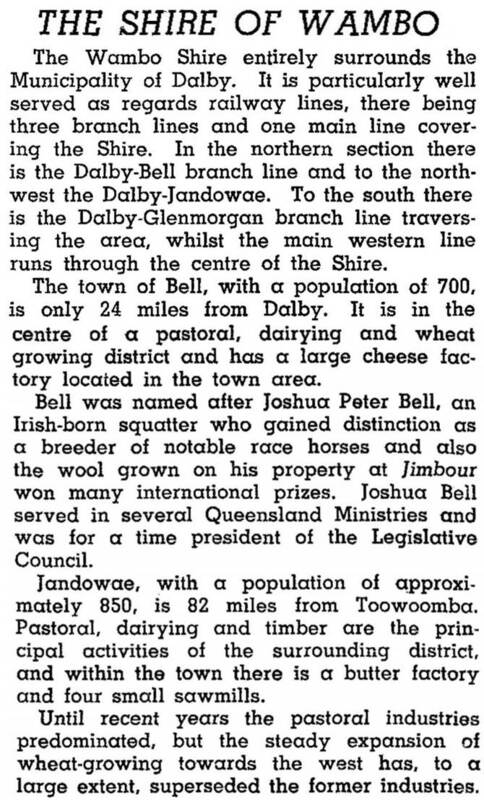 There were dairy factories in Dalby and Jandowae and in 1945 there were over 53,000 dairy cattle in the shire. By then, however, mechanised grain farming had come to the fore: wheat plantings doubled during 1930-50, reaching 226,000 ha. Barley, sorghum and linseed plantings also increased. It was dairying which fell away, from 40,000 head in 1955 to 7000 in 1980. The 18,000 pigs in the Shire in 1955 were associated with the dairy industry, but grain feeding saw their number grow to 45,000 in 1994. Beef cattle numbered 94,000 in 1994 and sheep and lambs about 22,000. Cereals, legumes and field crops occupied 148,000 ha including irrigated and dry land cotton. Wambo Shire's population peaked in 1961 with just over 7000 people. Its population in 2001 was a little over 5000, but there is a strong urban centre in Dalby which has maintained a population of about 9500 since the 1970s. Dalby and Wambo Councils conducted a large livestock saleyard. Nearly 50% of the Shire's employment was in agriculture. The manufacturing, retail, education and health and community services employment figures ranged between 5.3 and 7.9% of the shire's total workforce, and some of those are probably employed in Dalby. *Before severances for Tara, Chinchilla etc shires.